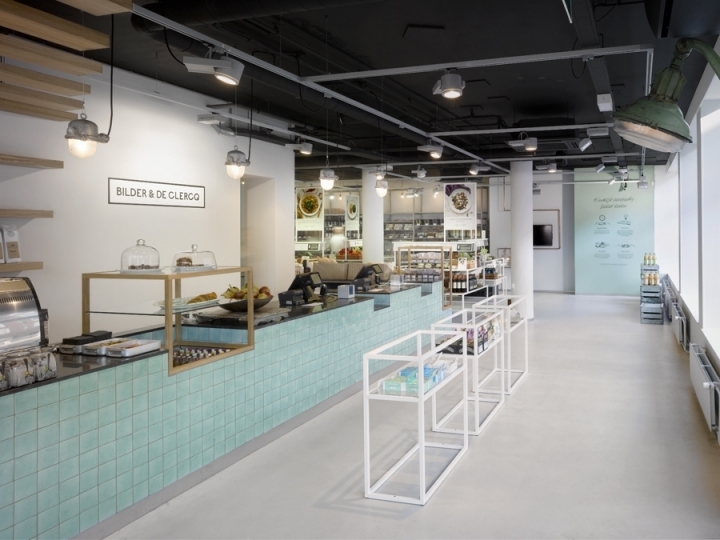 Amsterdam’s Bilder & De Clercq is a food retailer with a difference. 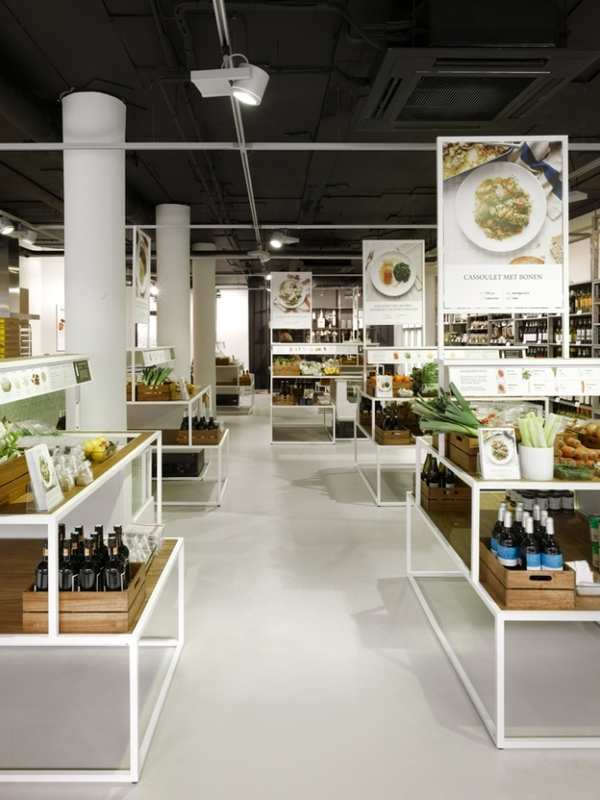 In the store, customers find everything they need to create 14 different dishes, each one packaged as the ingredients for two portions and step-by-step instructions for making it. 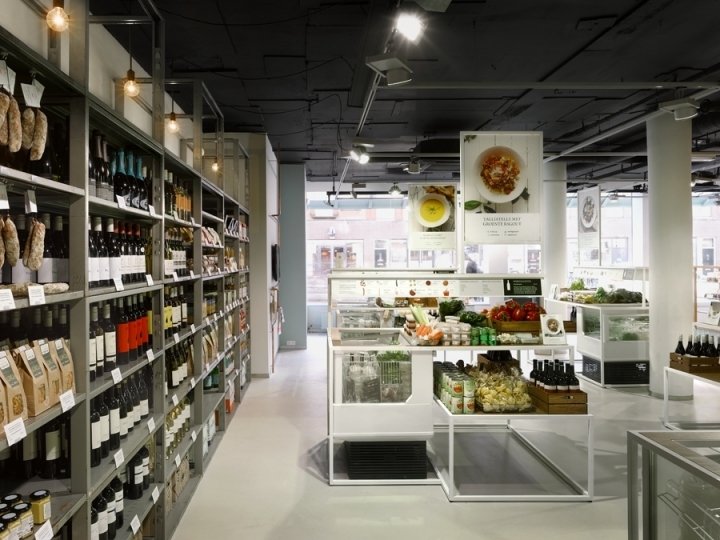 The shop also stocks everything else they might need for their meal, including fine wines, fresh bread, desserts, kitchen equipment and a variety of organic products such as jam and olive oil. 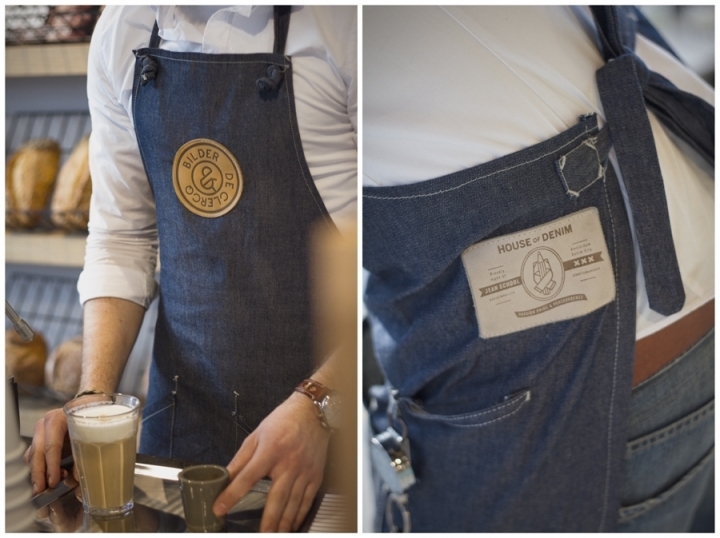 staat creative agency created the whole concept for the brand, right down to the denim aprons (made by students of The Amsterdam Jeans School). 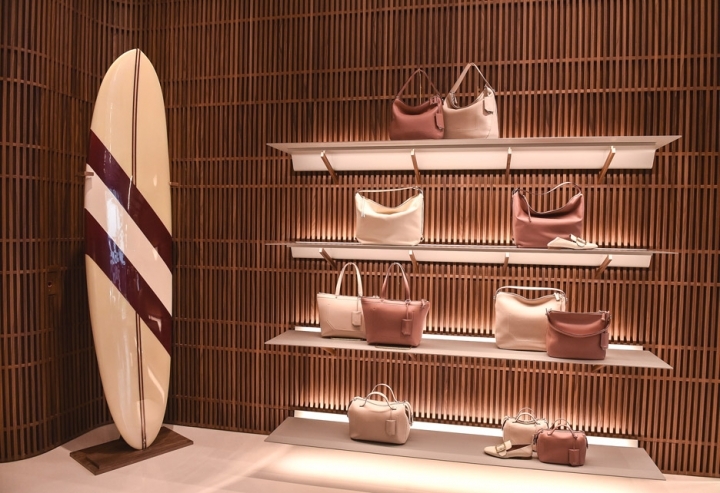 Rather than traditional supermarket aisles, the store is equipped with bespoke display furniture. 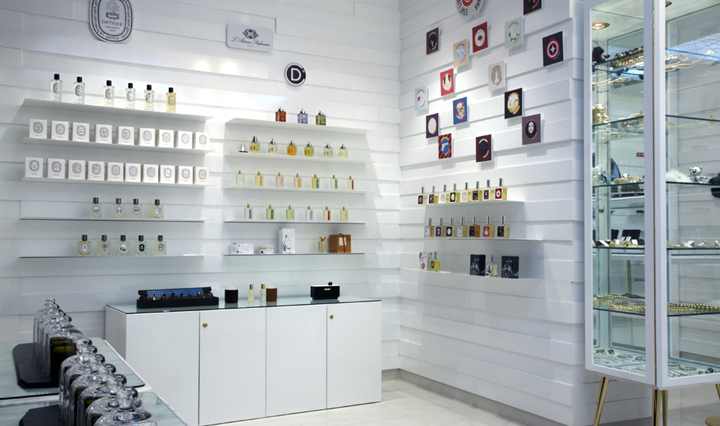 Simple grey shelves line the walls, while the display islands are composed of stacked, white 3D frames that create an airy and light effect. Each display island shows off two dishes, and visitors can browse among them as though visiting a market with various stalls. 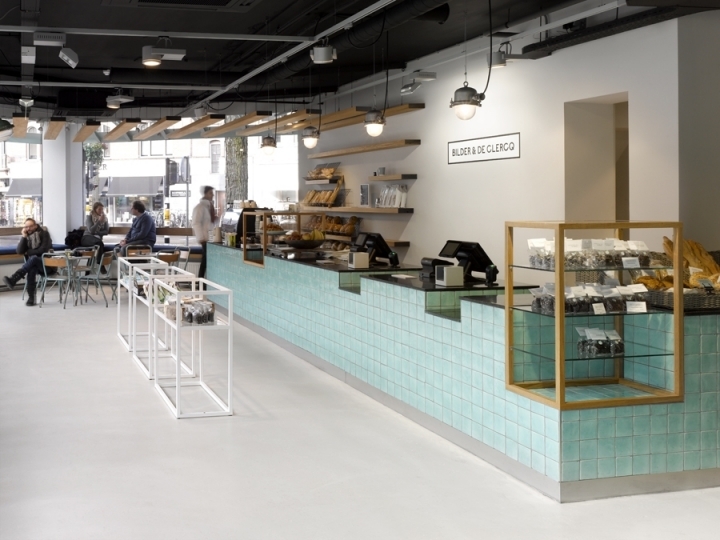 An inviting counter opposite the entrance integrates a coffee bar, cash registers and the kitchen. The grey palette is combined with warm wooden tones and a touch of copper green, giving a fresh look. The artisanal ambience is boosted by the hand-crafted tiles, copper fittings, custom-made furniture in wood and steel, concrete floor and a sprinkling of vintage furniture. Product presentation has a casual touch and packaging is simple – more small-scale delicatessen than big supermarket. 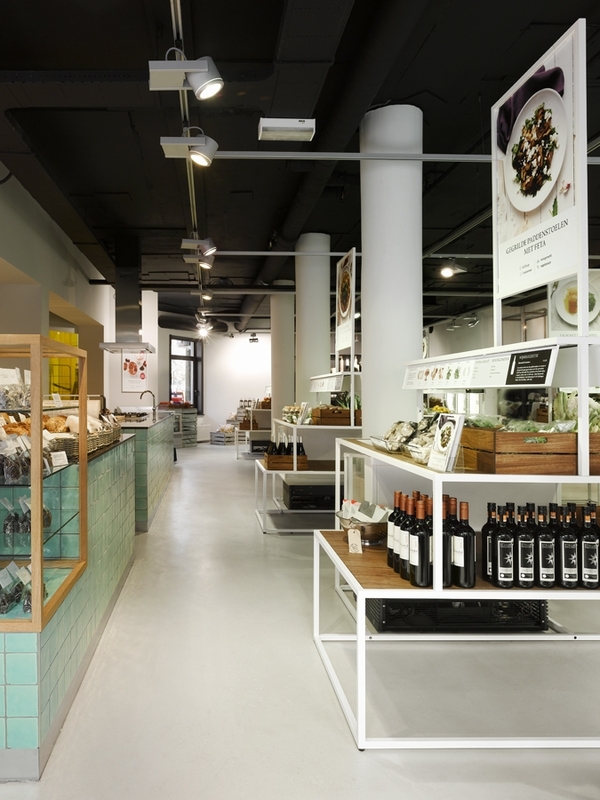 It all adds up to a light, contemporary, industrial aesthetic combined with the traditional but updated feel of a quality grocer’s shop. 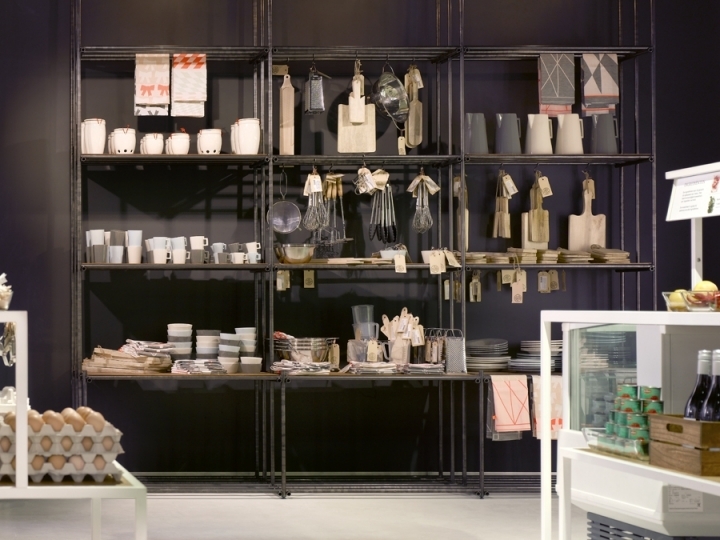 This shop is one of the many inspiring retail interiors featured in our upcoming book Powershop 4. Sign up to your newsletter to be kept informed about this book, which is scheduled to be released in February 2014.